If you want to gaze upon gentrification in action, you could do worse than visit Tesco on Morning Lane, Hackney, in London’s trendy east London. A well-stocked ‘world foods’ section with Vietnamese, Jamaican and African products attests to a multicultural community, enriched by several waves of immigration. Young families with expensive four-wheel-drive pushchairs head for the wholefoods aisle, members of the latest wave of newcomers – the upwardly-mobile middle classes. They were themselves attracted to Hackney by the vibrancy and buzz of an area whose low rents drew in students and ‘young creatives’ priced out of more central districts. As well as the usual butcher’s counter, Tesco Morning Lane has a halal butcher, managed by an outside company. Next to that is the bakery section, which has just been rebranded as the Bakery Project. It’s a pretty representative juxtaposition. So what is the Bakery Project? It’s a joint enterprise between Tesco and Euphorium, an independent artisan bakery that opened in Islington, north London, back in 1999. TBP claim they’re ‘working to restore old school classics, support local suppliers and charities but most of all make simple, honest, great value bread and cakes.’ Well, I was dead excited when I saw all this in store. The product line sounded great, and I love the fact that they’re focusing on British classics, rather than falling into the trap of licking the arses of other food cultures too slavishly. 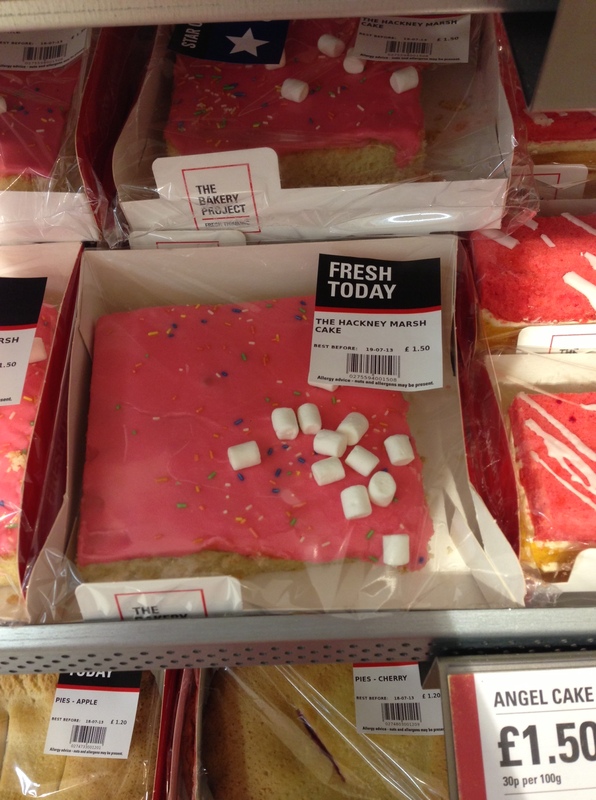 Think Victoria sandwich, Dundee cake, jam doughnuts, rascals, farlings, Battenberg … and angel cake, my absolute childhood favourite. Imagine, as I did, a really top-notch angel cake, full of nostalgia, but without the e-numbers and trans fats! Heavenly thoughts in mind, I hurried to the back of the store. But then, I thought as I bypassed the fruit and veg and made straight for the cakes, it makes perfect sense for something like the Bakery Project to appear in this Tesco. It’s a clever move. Hackney is now middle-class enough to have a large community of people (including me) who are increasingly aware that pappy, plastic-bagged, pre-sliced supermarket bread isn’t exactly brilliant, and who want more. I know that some people are pretty sniffy about Tesco’s involvement with independent artisan businesses. It’s not just Euphorium. They’ve also bought a 49% stake in Harris + Hoole, the mini-chain of coffee shops – something which caused disgust and uproar among some previously unaware regulars when the news came out. Some bigger branches of Tesco now have Harris & Hoole coffee bars in-store. But you know what? I’m not sniffy about it. Not at all. Basically, I want as many people as possible to have access to good bread (and coffee, and all other kinds of food). It’s a sad fact that until awareness spreads, only better-off communities will realistically be able to support a stand-alone artisan bakery like Euphorium, or e5 bakehouse, or De Gustibus. What’s more, these businesses are often relatively small, without the capacity to actually supply every household with their daily bread, even if they were all clamouring to buy it. So, if what you care about is getting good bread to as many people as possible – you’ve got to take it to where those people are. If that happens to be a supermarket, then get over your snobbery, and get in there. Oh, you can publish as many hand-wringing articles in right-on publications and talk about it on Radio 4 as much as you like: you’re not going to change much that way, at least only very, very slowly. So be pragmatic. If people shop in supermarkets, I’m more than happy for them to have good baking put into supermarkets, so they can get to it easily. Up with that sort of thing. 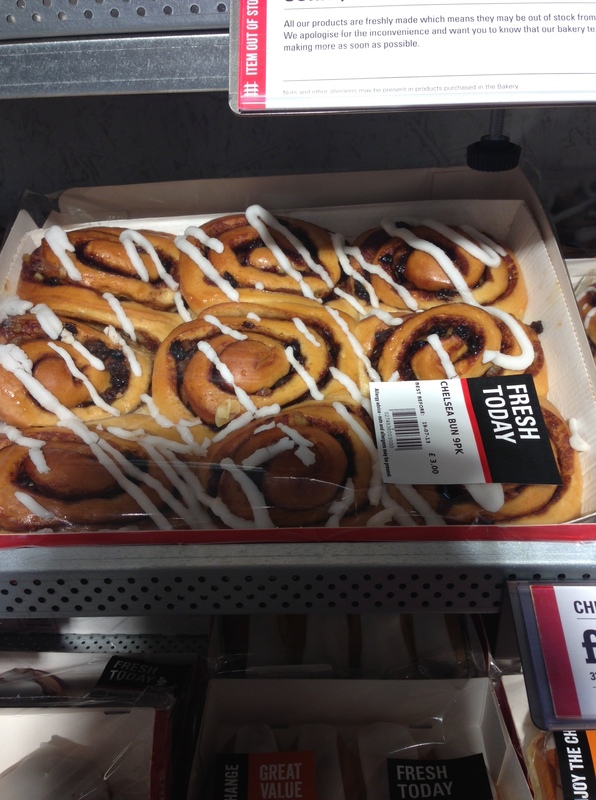 There’s just one flaw in the plan as played out at Tesco Morning Lane. I’m afraid this particular story doesn’t end well. Everything I’ve tried from the Bakery Project – and I’ve tried a lot – has been disappointing, or downright unpleasant. It’s Greggs-esque – at best. 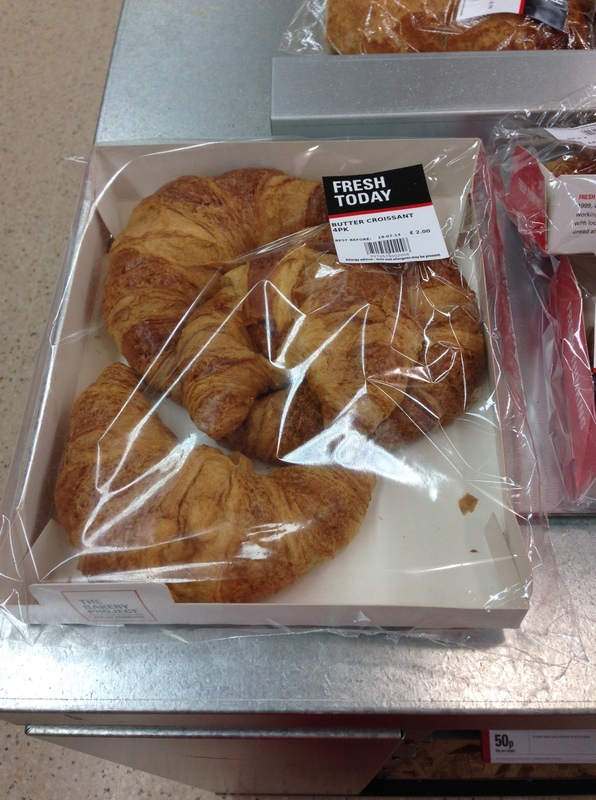 The croissants are criminal, the cakes are dry, everything seems to be made with margarine rather than butter, and the bread itself is pretty indistinguishable from the standard supermarket ‘baked in store’ nonsense. It’s definitely not everything that good, honest British baking should be. The only exception is the doughnuts. The doughnuts are nice. But then Gregg’s do brilliant doughnuts too. It’s hard to go too far wrong with a jam doughnut, frankly. It looks like we haven’t quite cracked the puzzle of how to not only make good bread accessible, but a no-brainer. I’m all for putting it in supermarkets. But the Bakery Project clearly aren’t going to be the ones who do that, unless they up their game. Perhaps it’s the price constraints; perhaps the challenges of large-scale production. But someone must be able to do it – otherwise I do fear that good bread will always remain, very largely, the preserve of the consciously foodie middle classes. I just wonder who’ll have the guts, the humility and the know-how to make it happen. You think THAT’S bad? Have you tried Tesco’s own brand of still water? It’s horrible. I thought it would at least taste of slight filtration, but no. I was hoping it would taste of Mineral. Mineral Water. It tastes as bad as tap water.